I’m really pleased to see so many comic shops taking The Scarifyers comic, Simon Barnard’s funny & suspenseful 1930s supernatural mystery, which I had the pleasure of drawing. The latest good news is that Gosh! Comics is stocking it. I’m pretty excited about that, but also massive thanks must go to Joe Gordon and co. at Forbidden Planet International for being the first to take a chance on the comic, putting a fantastic review on their blog and then stocking the comic in their stores. Here’s a list of ‘bricks and mortar’ comic shops stocking The Scarifyers issue 1 (that I know of, will update as I learn of more). I’ve included the phone numbers, in case you want to ring first. Don’t forget if it’s sold out or none of these shops are near you, Cosmic Hobo is selling the comic (and the CDs which spawned it) online. And the Forbidden Planet International stores. American readers of this blog stay tuned for news on buying in the US! Apologies to anyone who is waiting for the Brunel & The Sphinx giclée prints to appear in the webshop. A bout of illness has set me back by a whole week, but the files are with the printer now and will go on sale in the next few days. Thanks for your patience! UPDATE: My framed pieces have both sold, but I still have unframed, mounted drawings and postcards for sale at the gallery. I have a couple of pieces in a new charity exhibition in Bristol, at the Grant Bradley gallery. Bristol charity The Harbour – a unique, specialist service providing free counselling and psychotherapy in the South-West for those affected by life-threatening physical illness – is celebrating its 21st birthday with ‘Harbour 21’, an art exhibition at the Grant Bradley Gallery, Bedminster, Bristol, 9-30 June; open preview Friday 8 June from 6pm. Prominent ‘medico-political’ artistic collective Pharmacopoeia, whose extraordinary and imposing Cradle to Grave installation is a permanent highlight exhibit at the British Museum, are showing alongside popular Royal West of England Academicians Neil Murison and James Beale, Spike Island artist Judy Rodrigues, and well-established local artists and photographers such as Valerie Bowes, Mark Simmons, Sophie Howard, Gavin McClafferty and Simon Gurr, plus some exciting emerging talents. 50% of all sale proceeds go to The Harbour. It’s humbling to be in the same show as so many amazing artists. 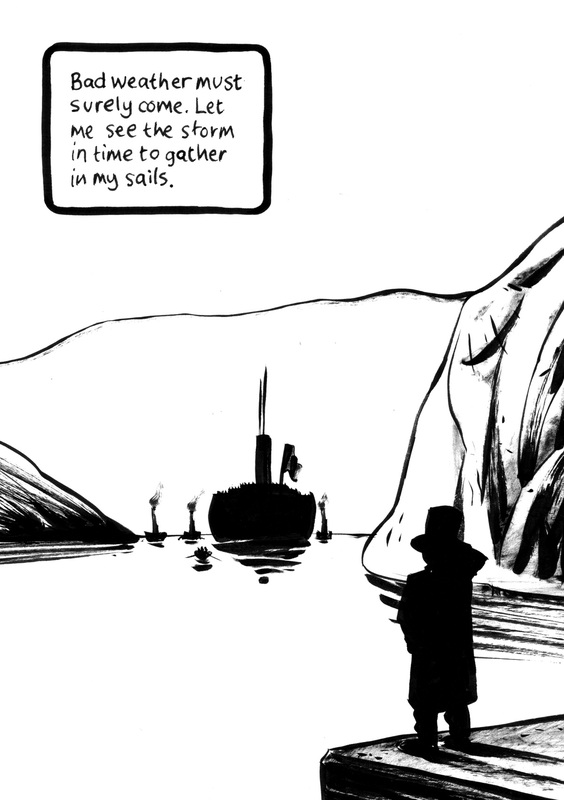 My contributions are new brushpen drawings, based on scenes from Brunel: A Graphic Biography, the 2006 comic book by Eugene Byrne and me. I thought it would be interesting to go back to the clean, vectorized artwork of that book and apply more expressive, hand-made marks. I also wanted to see what happened when an individual frame was enlarged and taken out of the context of the narrative sequence. Finally, from next week and for the duration of the exhibition, my own shop will have a limited run of A4 prints of Brunel & the Sphinx. Until now this print has only ever been available at a much smaller size. After printing costs have been taken off, 100% of the proceeds of these new prints will go to The Harbour.